Born in Taiwan, Chen graduated with a master degree from the Chinese Cultural University in Taipei and a Bachelor degree from the Tainan University of the Arts. She has toured in Europe, North America, and China. Currently, she is a member of the Little Giant Chinese Chamber Orchestra, TCO College Orchestra, Taichung Pipa Ensemble, and performs regularly in solo recitals and as soloist with orchestras at the National Concert Hall in Taiwan. Chen is also active performing in theatre, music theatre, and multimedia productions. Klaus Bru (Saxophone), a German, who has lived in Taiwan and China for decades, has worked with an abundance of artists in dissimilar musical contexts, covering a spectrum from Experimental Noise, Electronica, to Mainstream Jazz, and Pop Music. Bru is one of only a handful of saxophonists who specialize in the rare C-saxes, which he likes to electrify and treat like a guitar. He has performed and recorded with Marc Ribot, Sunny Murray, Franz Hautzinger, Peter Herbert, Michael Moser, Bilal Karaman, Li Jian-Hong, Aming Liang, Sabu Toyozumi, and Eddie Prevost. Shen has studied music in conservatory training since elementary school. She studied the sheng with Tsai Mei-Hua, Chen Hsiao-Ping, Huang Lung-Yi and Su Wen-Cheng; music theory with Yu Hsing-Yi and Huang Chao-Ying. She received her master degree in sheng performance from the Chinese Culture University in Taiwan. Shen has won many music awards, including the first prize of the Sheng Solo Competition organized by Chinese Music Association, Taiwan, R.O.C. She has given solo recitals in many prestigious venues, including the National Concert Hall, Taipei City Government Performance Hall, the Metropolitan Hall of Taipei Cultural Center, and Forum Music. Ling is a soloist with Little Giant Chinese Chamber Orchestra and a member of Taipei Chinese Orchestra Academy Orchestra and Taipei Youth Chinese Orchestra. Shen teaches the sheng at a number of schools in Taiwan. A multiple award winner, Charlie masters a wide range of Chinese wind instruments. Charlie is the principal dizi player and general director of the BC Chinese Music Orchestra, a member of the Vancouver Inter-Cultural Orchestra, and the co-founder of Pentatonics. As a soloist, Charlie has performed numerous dizi concerti and has performed on a number of CDs. 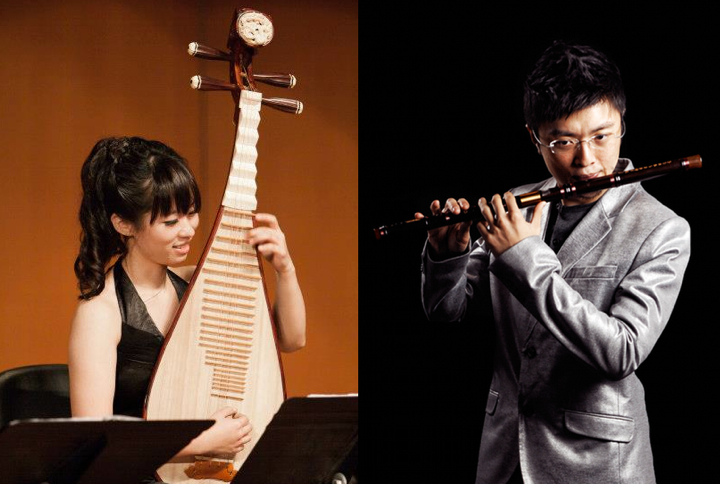 In 2011, he premiered concerto grosso“Tsu-ur Song” (潮歌) by Dr. Ning Wang (王寧) with the Nu: BC and the BC Chinese Music Ensemble in a Canada-China collaboration. In the same year Charlie also performed Steve Chatman’s “Earth Songs” with Vancouver Symphony Orchestra. Charlie studied the dizi with Jian Min Pan (潘建明) in Vancouver and Wei-Yu Tan (譚謂裕) in China.